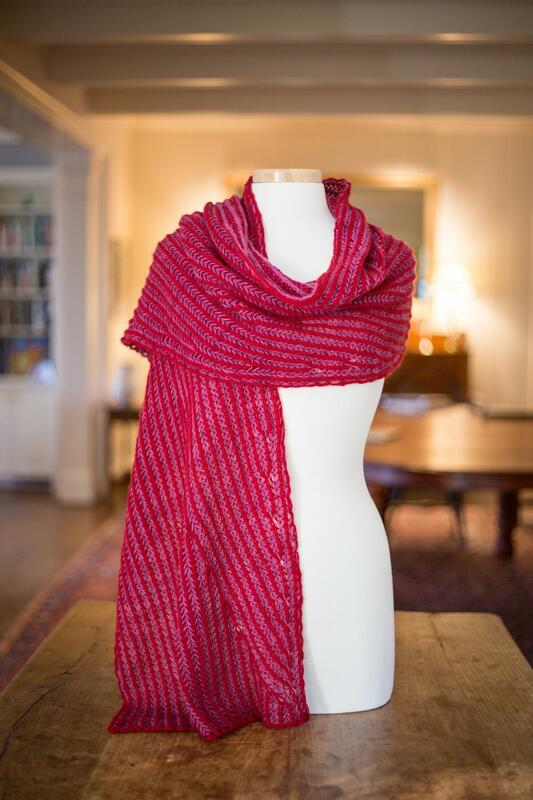 A splendid combination of classic and innovative, this glorious wrap is a swath of two-color brioche—with a twist. 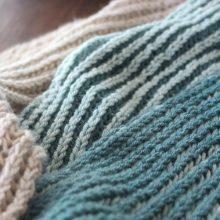 The lines of brioche shift as you knit, creating gentle arcs that resemble the feathers of a bird. 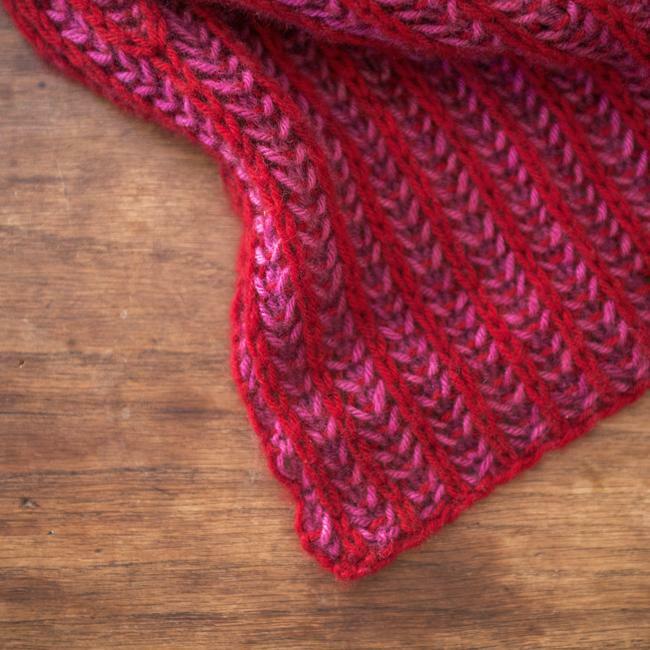 Or knit it without the arcs—an excellent first brioche project. 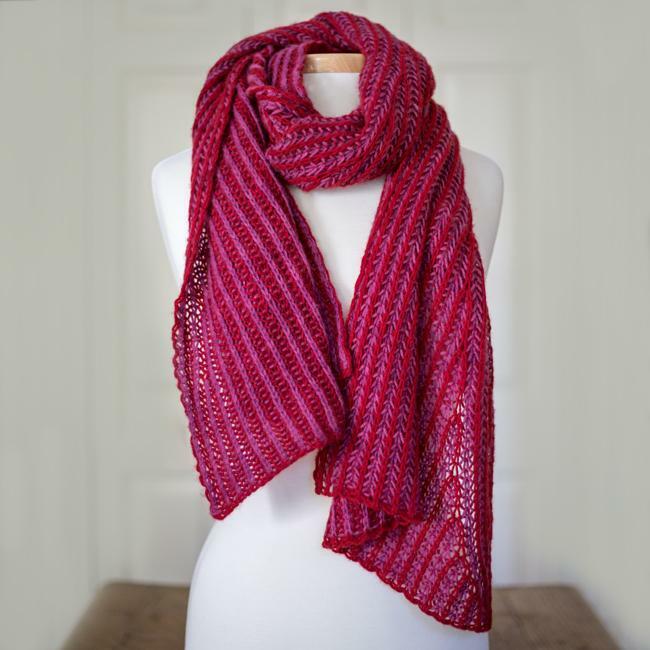 As often with Bristol Ivy, she turns a classic wrap into something very modern. 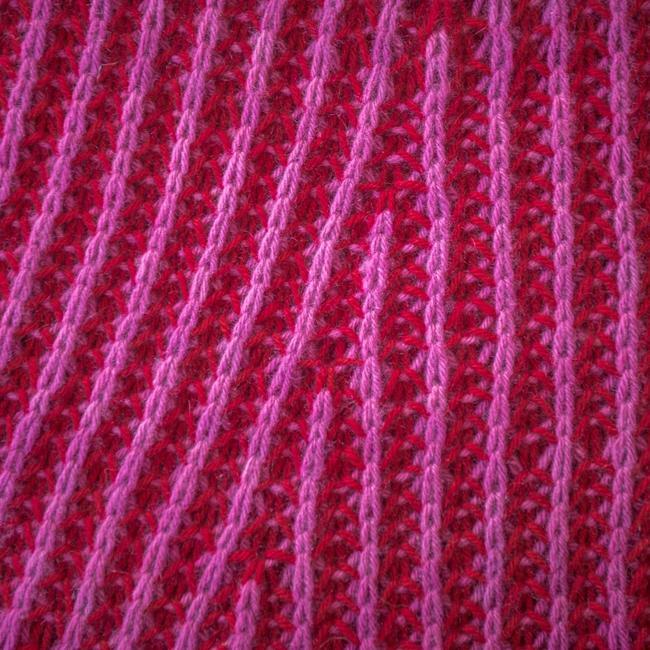 Plus, there’s a simple version of the pattern included, if you’d like to make a classic rectangle of brioche, without the shifting arcs. 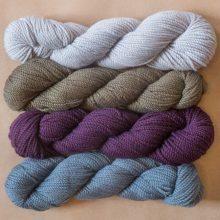 Bristol Ivy’s Nesting Wrap is the pattern to make when you have really special yarn. 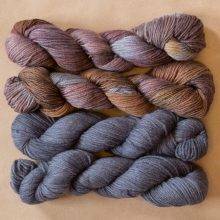 Two-color brioche is a stitch that every knitter should spend time with—it creates a fabric with the most extraordinary intertwining of colors. Even more amazing, the colors reverse on the other side, making for beautiful color play. 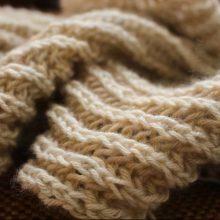 Knit on a large needle, the resulting fabric is airy yet cozy, surprisingly warm. 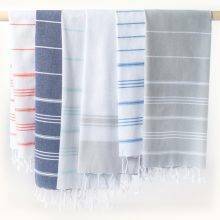 If you’ve ever wanted to create a wrap that will delight you every time you wear it, Bristol Ivy’s Nesting Wrap is the one. 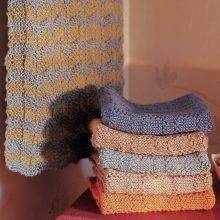 Quick tip: to make the brioche fly off your needles, we recommend using a pair of Susan Bates 10″ Quicksilver double-pointed needles, size 10 1/2. 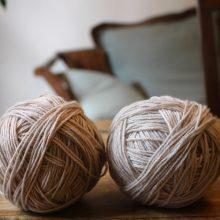 A circular needle works, but we’re kind of into this DPN idea. Use the DPNs with Clover rubber point protectors, one protector at one end of each needle. The point protector means you can slide your work back across the needle when working the second color yarn, move the point protector to the other end of the needle, and voila: no stitches get caught on the join of a circular needle cable. 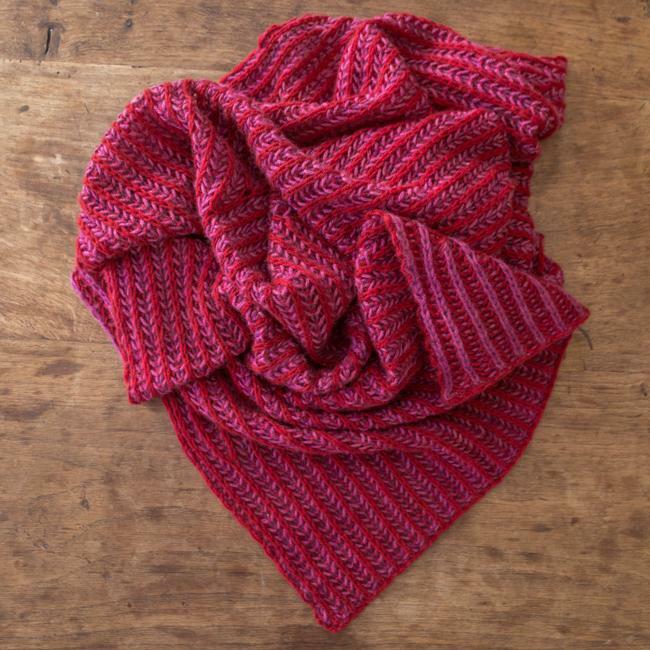 This will make sense once you start knitting, we promise! 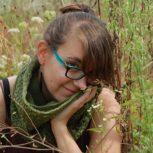 Bristol Ivy is a knitting designer and teacher from Portland, Maine. 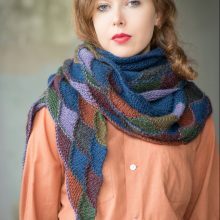 Her design work focuses on the intersection between innovative technique and classic tailoring, and her classes focus on creativity, technique, and understanding the nuts and bolts of knitting. 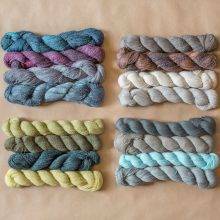 Her work has been published with Brooklyn Tweed’s Wool People, Quince & Co., PomPom Quarterly, Interweave Knits, amirisu, and many more. You can find her at www.bristolivy.com and on Twitter and Instagram as @bristolivy.